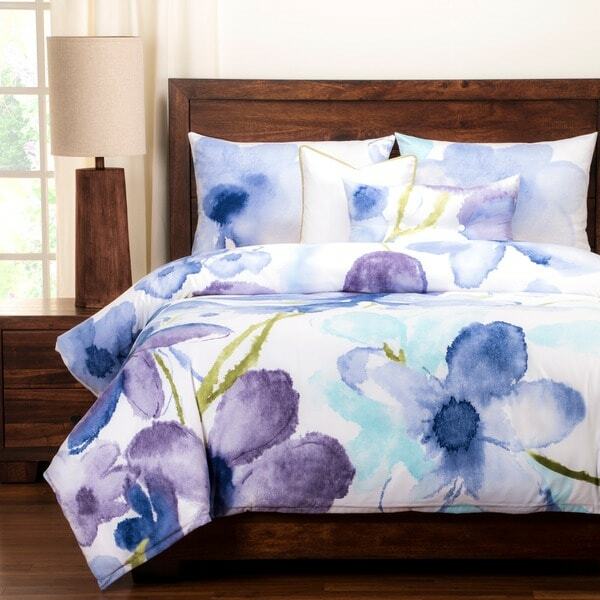 This floral duvet cover set makes a beautiful addition to any bedroom. Featuring a unique watercolor design with elegant blue and purple hues, this set brings a cheerful atmosphere to any space. A zipper closure and machine-washable material make this floral duvet cover set a practical yet stylish choice for your home. A REAL CAL KING SIZE!!! Wow, this is even more beautiful than in the photos! I had been looking for a new bedspread for years and just couldn't find what I wanted until I found this one on Overstock. The material is soft, all the pieces are well-made. The duvet itself is a good weight and has been very comfortable. It is very easy to get the pillow shams on pillows and to get the duvet cover on and off the duvet for washing. Two pillows are included in the set, one is the same pattern as the cover and the shams and the other is white with a green trim. I am so happy I bought this and would definitely buy again. My husband loves this as well. Paired with dark, Merlot furniture and periwinkle walls. Beautiful and durable. I've washed the pillow shams and duvet several times. The insert buttons on the inside of the duvet cover and stays in place. The fabric is very soft. I never want to leave my bed! I had very high expectations for this Duvet set and it did not disappoint, it was even better. First of all, it's every bit as beautiful as the picture...it looks like someone watercolor painted florals on a white bed spread. Second, the duvet is very soft, its even more soft than my high quality sheets. The padding in the duvet if of course removable, which is super awesome if you live some place like Florida and its way to hot to sleep under a bunch of fluff in the summer. The shams and decorative pillows are also just perfect. This set is rather expensive, but it is well worth it, I would recommend it to anyone. I love it! I love it!! It's just exactly what I was looking for! I was looking for something very different & this is certainly it! Beautiful watercolor looking hues of purple. Comes with two accent pillows. Beautiful comforter duvet...an all time favorite! This comforter is full and the colors are magnificent! It is a fluffly comforter and the shams & decorative pillows are a refreshing color that adds style to a bedroom. I looked for months for the perfect spring/summer comforter and I found the perfect set. The duvet is removable which helps with laundering. This is an exceptional value for bedding of this quality. I highly recommend you buying it and enjoy the feel and the colors of the fabric. OMG.... this Queen duvet is gorgeous. I have bought a few bedspreads in the past (and quite pricey I might add) and hated them once I received them. They either never looked like the pic or the material was gosh awful. This duvet is well made and so vibrant. Nice soft washable material. I painted and decorated the room, pulling out the purple colors from the duvet. (i used a lavender color on the walls) I love the fact that I can unzip the cover to wash it (i have not done that as of yet though). Totally worth every penny! I had to buy a bedskirt though to give a finished look. I received the duvet set and it looks just like the picture! Looks great in my newly painted gray room. Adds an elegant look to the room. Very soft too! I love that the shams have zippers across the length instead of at the end. It makes it easy to get the pillows in and out! I recommend this set ~ you won't be sorry! Best $ I ever spent on bedding.......it suits the room colour and space. So clean looking. I love it! I wanted a bedspread with purple to complement my decor, and it's difficult to find something that is not flowery. This provides a beautiful watercolor look. I was a little surprised that the accent pillow was plain white with green piping, but verified that the picture showed a plain pillow. I may appliqué or paint something on it. Overall I'm very happy with it and love the colors. I really liked the fabric and the duvet, however I returned it since the colors were brighter than I expected. I wanted more of a pastel. I know the computer photo can be misleading but I took a chance. The blue is a bright navy. Beautiful, colorful comforter that will make any bedroom bright and cheery. Nice quality material. I highly recommend this product. Bought as a gift for my daughter. Her friends are always telling her that her bed is so beautiful and want to know where she found the set. It really is a stunning bed set! Beautiful, great material and so warm. Great pick! I loveee this comforter! The colors are gorgeous and really transformed my bedroom. It was worth every penny, if you are debating spending the money on it then do it! love. I am in love. Soooo pretty and very warm. Excellent quality set. I absolutely love this bedspread. It reminds me of a large watercolor. It's like having a work of art on your bed. Everyone who has seen it loves it. Beautiful set with everything you can ask for in the bag. Looks great in my room and I love how it brings out the color in the room. I would definitely recommend this! "when will this duvet set be back in stock?" "can I purchase another duvet cover for the insert included in this set? (just in case I wanna change style once in a while)Thanks!" "What is the thread count of this set ?" This is polyester and does not have a thread count. "I received a king duvet and absolutely love it! can u purchase the long accent pillow it came with one and square pillow but it would look better with another rectangle pillow and are there curtains to purchase?" There are not any additional pieces for this set available at this time. "What does THIS MEAN? "Answer: It i98s a duvet itself and not a duvet cover ruth H. Jan 19, 2017." I'm trying to find out if a REGULAR KING-SIZED COMFORTER WILL FIT INSIDE THE DUVET COVER. That is what duvet covers ARE. They COVER COMFORTERS. The description says there is an insert. I don't care about the insert; I'll take it and won't use it. I want the duvet COVER FOR MY COMFORTER. WILL IT FIT INSIDE THE COMFORTER since you're including an insert which is probably THIN, UNLIKE A DOWN COMFORTER, WHICH IS WHAT I HAVE AND NEED TO KNOW IF IT WILL FIT INSIDE THE KING-SIZED DUVET? I hope I've made myself clear. This is NOT a hard question!! Thank you. AND, IS IT A FINAL SALE? Another easy question for someone to answer." "Can I just buy the duvet cover without the insert please ? the whole set except the insert? thankx"
"Sorry, one more question. On only ONE website was this duvet comforter set described as "microfiber," whereas everywhere else I read that it is polyester (which I realize, microfiber falls in the poly family). IS this microfiber? In other words, is this that jersey-type material or can someone better explain? The reviews are fantastic, all saying how lovely this material is, but I'm not a fan of microfiber, which would make me have to continue my 3-year search for a duvet (no kidding; it's very frustrating). This is the most beautiful duvet I've seen in years, so if someone can get back to me with all the answers to my four submitted questions, I'd be highly appreciative. Thank you so much and have a lovely weekend. Spiritheart52"